These inspirational words were Sonal Shah’s battle cry in the fight against the disease that took her life on November 28, 2015. 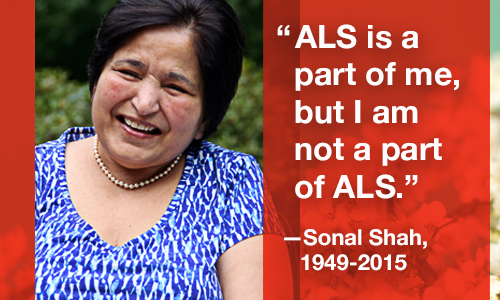 Mrs. Shah valiantly battled ALS for three years, leaving behind a legacy we can all learn from. Born in India, Mrs. Shah immigrated to the United States after earning her law degree in the early 1970s. 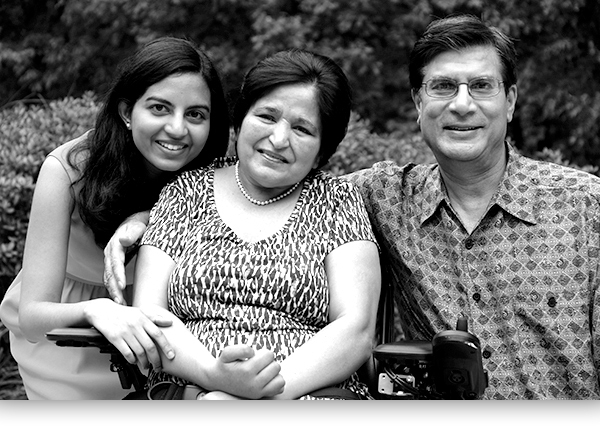 Throughout her life, Mrs. Shah made it a point to lend her voice to the issues that were closest to her heart – international adoption, women’s equality, politics, and, after her diagnosis in 2012, ALS. Mrs. Shah didn’t let progressive weakness and dysarthria slow her down. Instead, the Shah family, led by Mrs. Shah herself, have been exemplary ALS advocates – overcoming challenges the disease presents to spread ALS awareness throughout the country, attend The ALS Association’s annual ALS Advocacy Day and Public Policy Conference each year in Washington DC, and champion legislative priorities that are important to the entire ALS community. Here is just one example of Mrs. Shah’s impressive leadership: last fall, Mrs. Shah’s tenacity garnered the attention of Gov. Chris Christie, who in response to Mrs. Shah’s appeals, declared May as ALS Awareness Month in New Jersey and even set aside a special ALS Awareness Day on the third Wednesday of the month to honor those who bravely fight the disease! Today, Mrs. Shah’s husband and daughter, Nirali, carry on her torch, continuing to advocate on behalf of those living with ALS. One person – one person who does not give up – can influence positive change in this fight. And that person can be you. Learn more about how you can follow in Sonal Shah’s path and make a difference in the fight to bring awareness to the devastating effects ALS has in the lives of so many.